Crime moves at a truly frightening pace in the depths of Gotham and the various other cities that have began to draw the attention from the notorious villains so often defeated by the Caped Crusader and his allies. With such an endless stream of villainy that could crop up at any moment, how is a superhero supposed to keep their secret identities secret!? We don’t all have the supersonic speed of Supes or the Flash. Some of us have to rely on our standard, every day astonishing acrobatic maneuvers and fighting prowess! Fortunately, some advanced technology has been put into play to offer the needed armory without requiring the extensive and time consuming process of making sure each bulletproof plate is buckled in and every carbonfiber strap is properly laced. Now, it can be as simple as pulling over a solid hero’s uniform as if it were a T-shirt. Just like magic (but, it isn’t—it is definitely advanced technology). 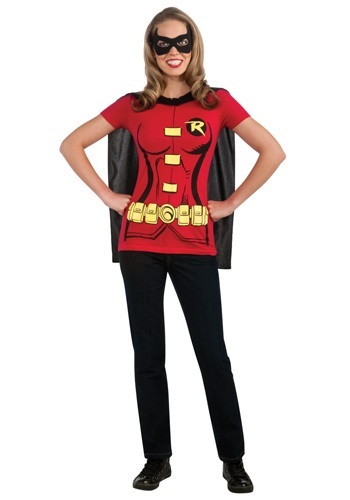 Now you can also leap into the fray without the dreadful time consumption with this Women’s Robin T-Shirt costume. 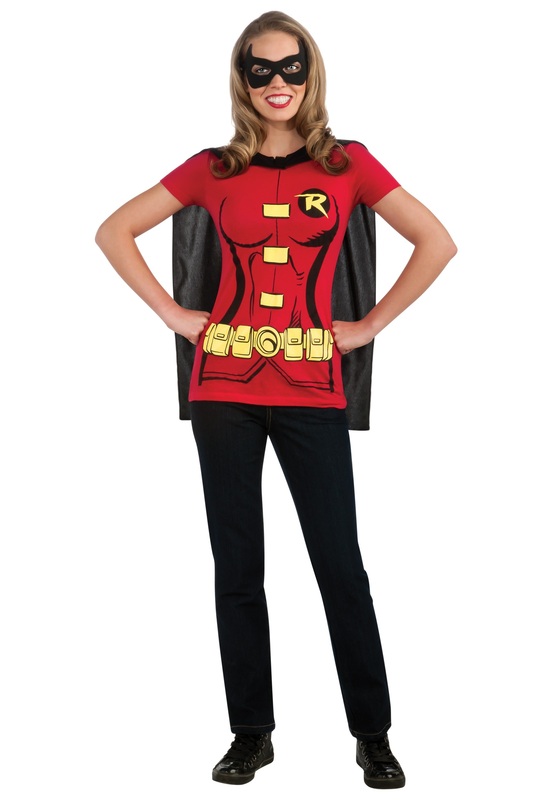 An easy transformation with this red shirt and your Robin costume details, including trendy black cape, and you shift from your seeming “regular gal” appearance into the heroic Robin—and you won’t even need to side track to the Bat Cave first! Two-Face and the Riddler might be quick to plan, but they won’t have a chance when you show up unexpectedly and clobber their plans to mere memories with plenty of time to get back to high society.